What's Nokia got to shout about? Is an N9 with a different OS worth shouting about? Technology firms' keynote speeches tend to be boring affairs. The important news leaks days or weeks before, so you're left with a big room full of people mumbling "yes, yes, navigation, seen it before" as the CEO bumbles on for hours about each new feature. Faced with a familiar problem - everybody knowing exactly what they were going to unveil - Nokia decided it was time to shake things up a bit. First, Stephen Elop kept pronouncing the company's name in a funny Canadian accent - "know-key-ahh" - and then, they let a madman loose on stage. "Our ambition is to surprise you at every turn," said Kevin Shields, a man whose job title - senior vice president of program and product management for the smart device - is longer than many people's lives. And then he started shouting. "It looks AWESOME!" he bellowed, channelling his inner Ballmer and scaring the hell out of the first six rows. "It feels GREAT in your hand!" he added, frightening everybody again. "It SCREAMS premium!" he screamed. Whatever Shields was on, it didn't last long. Like an angry man in the pub who's just offered to fight everybody outside, his mood suddenly crashed and Kevin became a shadow of his former, screaming self. "You've got to give me some applause for this," he begged, his eyes moist. The crowd clapped politely, afraid that if they didn't, Shields might eat them. No, the keynote wasn't boring. I really like Windows Phone, and I really like Nokia hardware. 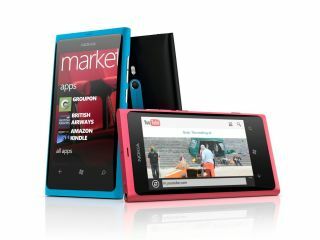 Given that it's essentially an N9 running Mango, I'm sure that the Nokia Lumia 800 is going to be a perfectly good smartphone. The prices look OK too. But there are plenty of perfectly good Windows Phone smartphones with OK prices out there already. Nokia and Microsoft have been working on this stuff for months. What were they doing? It's great that the two firms are going to spend oodles of cash on promoting the devices, and by extension Windows Phone generally. But where's the magic? Where's the "lust" that marketing VP Steven Overman promised to inspire? Where's the excitement that's going to make us see our iPhones and Androids for the overpriced toys they truly are, causing us to shove them on eBay and run, not walk, to the nearest Carphone Warehouse, two forms of ID including a utility bill in our trembling hands? There was plenty of shouting, but was the Lumia 800 really worth shouting about?